CoilART Mino 2pk PodsRefillable replacement pods from CoilART for the Mino Pod Kit, with a 2mL e-liq..
CoilART LUX Tank 3pk Mesh CoilsThe CoilART LUX Mesh Coil is available an M1 0.15 ohm Mesh ..
CoilART MAGE Mech V2.0 Mod - STACKED EDITIONThe MAGE Mech V2.0 Stacked Edition is a 26mm diameter me..
CoilART MAGE SubTank 3pk CoilsThe CoilART Mage SubTank Replacement Coils are built for the Coil..
CoilART MAGE 217 KitThe MAGE 217 Kit by CoilART is a uniquely designed kit. It features the MAGE Sub..
CoilART MAGE SubTankThe CoilART MAGE SubTank is a uniquely designed 24mm atomizer with 4mL juice cap..
CoilART Mage V2 RTACoilART brings back their popular Mage RTA in its new and improved version 2! 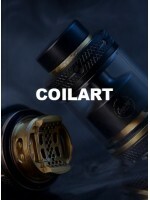 The..
CoilART Hand Made Single Piece CoilsAlien Coil 0.3 OhmClapton 0.5 OhmFlat Clapton 0.25 OhmFused Clap..
CoilART DPRO 133 KitCoilART DPRO 133 Kit with DPRO RDA is the latest vape kit from CoilART, made of ..
CoilART D-PRO RDA24mm diameter36mm overall heightcreative postless deck24K gold platedextra bottom f..
CoilART 10 Piece CoilsAlien Clapton - 0.45Alien Wave Flat - 0.2Clapception - 0.75Clapton - 0.85Clapt..